Wu Chien-Lien and Andy Lau ride in A Moment of Romance. The Skinny: This ultra-classic triad melodrama is probably one of the most popular and imitated Hong Kong films of the nineties. It also holds up remarkably well over ten years later, and will probably be remembered long after those Young and Dangerous movies. 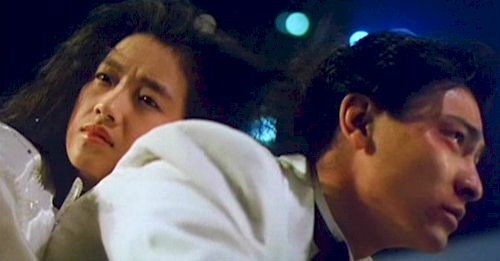 A Moment of Romance is responsible for many a Hong Kong Cinema cliché, and indeed the film is itself far from original. A disaffected youth, a "good girl" romantic interest and a cartoonish villain all figure into the 1990 hit. Director Benny Chan has his way with the clichés, and throws in enough slow motion, syrupy Cantopop montages and hyperemotional crescendos to tax even the most weepy audience member. However, regardless of its genre excessor perhaps because of itthe film succeeds, and is even viewed a classic of its genre. Andy Lau is Wah Dee, a tough triad member who gets drawn into a spiraling circle of events. He's picked by fellow gangmember Trumpet (Tommy Wong) to be the getaway driver in a jewel heist, but things don't go as planned. The getaway is chaotic, and Dee takes a rich student, Jojo (Wu Chien-Lien), hostage to make good his escape. Trumpet wants her dead, as she's seen their faces, but Dee lets her live, saying that he'll be responsible for her. Presumably, Dee believes she'll let them off in exchange for her life, but he doesn't even posit such an exchange. He merely puts her on his bike, takes her home, and lets her go. He's like a Chinese Clint Eastwood, only he rides bikes and looks like Andy Lau. Unfortunately, things are not that easy. The cops find Jojo's purse at the crime scene and drag her in for questioning. She still won't identify the robbers, but Trumpet doesn't want to take any chances. Dee rescues her again from Trumpet's clutches, but the seeds are sown. With an internal gang war brewing, Trumpet wants Dee dead, and the cops (led by Lau Kong) want him brought in. And, Jojo wants his affections. The "good girl loves bad boy" scenario is far from new, but A Moment of Romance is far more than a teenybopper romantic fantasy. Dee is a through-and-through triad, meaning he's not averse to violence or criminal activity, but there's a basic morality within him that prevents him from simply doing away with Jojo. His existence reveals itself to be one of resigned self-loathing. He's not happy with his life, but sees no real exit. It's that internal angst that drives him to reject Jojo at first, and even to mistreat her in hopes that she'll leave. Eventually he accepts her love, but the choice is not made frivolously. It's handled quietly, and with a subtle emotional weight. Not that A Moment of Romance is devoid of the grandoise cinematic flourishes that characterized most Hong Kong films of the day. There's a large helping of slow motion, romanticized visuals and overblown Cantopop tunes that line the way, but Benny Chan manages to use all of the above without alienating his audience. The core emotions that the film mines are so innately compelling that they're not lost beneath bombastic montages or sudden flashes of gangland violence. The actors neither overplay nor underplay the material, and inhabit their roles perfectly.  The famous bike-riding scene at the end of A Moment of Romance has been parodied in countless Hong Kong films. The most famous parody was in Needing You (2000), but the one in Feel 100% (1996) is pretty funny too.  Andy Lau also played triad characters named Dee in both A True Mob Story (1998), and Prince Charming (1999).  This film rocketed Wu Chien-Lien to stardom, and she co-starred in two unrelated A Moment of Romance sequels, one with Aaron Kwok and one with Andy Lau. She also played another character named Jojo in Love and the City (1994).